Currently held in storage with Cliffe Castle Museum, Keighley. Previous Locations, Keighley Sunday Circle, Church Green, Keighley. 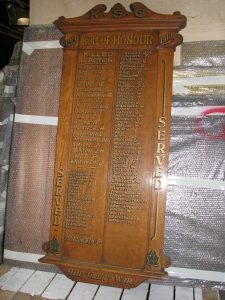 First World War war memorial, Oak board with broken pediment and inscription in gold lettering. Names on board 19 died, 68 served and returned. Ceremonies: Unveiling by Mayor of Keighley on 24th September 1922. Dedication by local clergy/dignitaries. Report in Keighley News 30th September 1922 and 9th September 1994.